I have been playing today with Foamiran Flowers and the new Rosy Owl Die sets and the NEW Pion Design My Dearest Sofia Collection. As usual they are all beautiful. The Pion Design "My Dearest Sofia Collection" can be found in the Pre-order Section. Here's a close up of the Foamiran Flowers and if you are going to Ally Pally I will be demo-ing these so be sure to pop along to see us. I was on a mission not to cover up the gorgeous flowers on the papers. I used the NEW Fantasy Magic Lace die for the side and across the top tag using the Pion Design Palette White II. I cut the gorgeous butterflies from the Borders sheet. 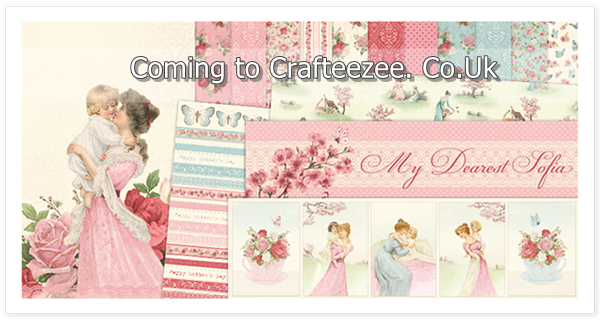 The little heart pegs and pearl border are from previous Crafteezee Collections.